Children are natural scientists. 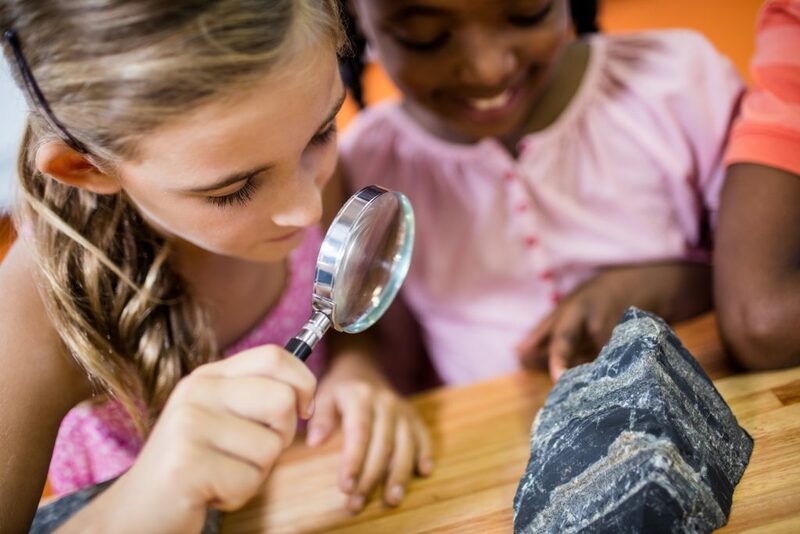 They investigate, explore, and learn about the world with boundless curiosity. This natural desire to understand the world is exciting and essential to your child’s growth. As a parent, there are many ways you can encourage your child’s curiosity with minimal cost or effort. Here are six inexpensive gadgets for your home that will help your child explore the world around them. Give your little detective the opportunity to inspect her clues up close. Magnifying glasses help your child explore by giving her a handheld tool that she can use anywhere. There are many types and sizes of magnifying glasses available, including options of safe plastic lenses to prevent broken glass. Your child can use this tool outside, to inspect flowers, bugs, and leaves, or keep it with them indoors to look closely at pictures, books, and other household objects. Magnifying glasses can be purchased online or at dollar stores. While small children may not yet understand how to tell time, a wrist watch is a great tool for them to practice numbers. If you choose a digital watch, you can ask your child to tell you the time and help them read the individual numbers on the face. Alternatively, an analog watch is a great tool to teach about the different parts of the day. Simply point out to your child the numbers that symbolize regular events in your life, such as meals, school, and bedtime. The golden standard for outside play, a bucket and a shovel are an excellent way for your child to explore his world. A child with a shovel and a space to dig can spend hours discovering a new world in the soil. Bugs, plants, and rocks are exciting discoveries for the very young. A bucket will help your child explore his treasures, as he collects the things that capture his imagination. A bucket also gives your child the option of dumping and pouring dirt or sand to create landscapes all his own. Spring is an excellent time to find buckets and shovels as stores prepare for summer. There’s no reason to let the rain keep you indoors! Giving your child her own umbrella gives her confidence to venture out and experience the wonder of rain. This might include puddle-jumping, watching the birds and the worms, or even a real adventure to Lake Lanier to watch the rain fall on the lake. While an umbrella won’t necessarily teach your child anything new, it will help her become a brave explorer. While some adventure tools can only be used outdoors, binoculars are a gadget that work anywhere. Whether your child decides to look from one end of your home to the other or to watch birds out the window, he will gain an up-close view of countless parts of his world. Binoculars are a great addition to a day at the park or a family bike ride, as they help your child explore his surroundings in a new and exciting way. There are many binocular options online. More than likely, you have fond memories of using a flashlight as a child. Flashlights serve as blanket-fort lighting, evening walk guides, and shadow puppet assistants. A flashlight is an inexpensive and simple gadget, but it brings hours of entertainment to young children. Flashlights can be purchased with almost endless options at many stores, including dollar stores. As young children grow, they interact with their world in various ways to learn about the way it works and their role in it. By providing your children with these simple and inexpensive gadgets, you help your child explore and learn about the amazing world we live in. Are you looking for childcare where children are encouraged to explore and discover every day? Consider Legacy Academy Roswell for your childcare needs. Call or visit for more information.